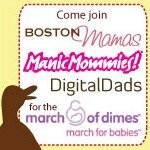 Friends, it's the final stretch and I am doing one last ask in this space: will you please support Team Boston Mamas & Friends with a donation to the team or my personal page? I am thrilled that we recently broke the $3,000 fundraising mark and I hope we can keep upping our contribution this week -- truly, no gift is too small! Thanks so much in advance for your support, and I look forward to rocking the walk on May 8th on behalf of all of you. And also a huge thanks to my sister Stephanie, who has been an amazing part of the fundraising effort; she currently is the top team fundraiser! Go Stephanie!